For most of us, our garages are more than a space to keep our cars. We use our garage as our workshops, office, and other uses. If this is the case, you need to make sure that it warm during the colder months. The main reason many people use their garage is that it offers more space than the regular rooms in homes. For this reason, the regular heater you use to warm your bedroom or living room may not be sufficient for your garage. In addition, most garages don’t have adequate insulation making them colder than the other rooms in your home. This is where the best propane garage heaters come in. Some of the reasons why these models are a great alternative are that they are effective warming larger spaces, affordable and other model being portable. They are also easy to use and require minimal maintenance. Besides, these models come with a simple thermostat that will allow you regulate the temperature you need. Now that you have the perfect choice for your garage, we would like to look at the best models available on the market. We will also give a short review of the features in each model to help you make an informed choice. Versatility is key to any decent propane heater and the Dyna-Glo RMC-LPC80DG offers you with plenty. This heater has the ability to generate 360 degrees of heat in your garage; construction sites another industrial building ensuring that you are comfortable even if you are working in cold climates. With a maximum out of 80,000BTUs, this heater will warm a large room almost instantly. This propane heater boasts of superior technology that ensures that your garage heats within a limited time. With 30,000 BTU capacity coupled with the advanced infrared heating technology, the cold weather will not keep you from performing the tasks you need to. This is a liquid propane ready heater, eliminating the hassle that comes with other models. The unit is compact making it a nice choice for the individuals with overcrowded workplaces or garages. If you are looking for a portable and powerful propane heater that you can use in your garage, house or office, this is a decent choice. Besides offering, you with efficient heat supply this unit comes with impressive safety features to ensure that you are hundred percent safe. Some of the impressive safety features that come with this unit include the tip over shut off feature as well as low oxygen shutoff. This is a perfect choice for individuals who are looking to turn their barn or garage into a working space they can use all year long. This is an 80,000 BTU heater that ensures that you will get reliable heat source all the time. The unit comes with a spark ignition system that makes it super easy to start. We also love the self-diagnostics that ensure that your heater performs optimally all the time. 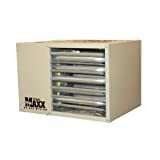 While this might seem like a pretty basic heater for smaller rooms, you will be amazed at its performance. With a capacity of 30,000 Btu, this unit will heat space of up to 1000 square feet efficiently. We also love the blue flame burner that is more efficient. Similar to other expensive models that you will find in this brand, this unit also comes with a thermostat and low oxygen automatic shut off. When the cold weather, especially in winter, creeps in, you need to find an efficient and safe way to warm your home. 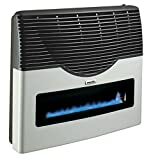 Martin Direct vent furnace heater is an ultra silent, compact, and smart heater that offers you the warmth in a large area without wasting gas. The unit comes with a decorative ceramic window that gives your home stylish and modern look. It also comes with advanced features that allow it distribute warm air efficiently in a large room. Another excellent choice for Mr. Heater engineered to make your life comfortable. This unit comes with a heavy-duty design so you can expect it to last for many years. With the ability to generate 35.000 BTUs per hour, you can be sure to get enough warmth, turning chilly into the comfortable working area. The unit also comes with a 20-liter propane tank, allowing it to run for 12 continuous hours. Established in 1916 Modine manufacturing company has more than a decade of experience when it comes to the production of heaters. The company is committed to producing high-performance product s that meets the customers’ needs. Over the years, the company has produced millions of units and sold them all over the world. The Modine HD45AS0111 has received a lot of popularity across the world with most users giving positive feedback. The unit comes with a low profile design that offers you with a reliable performance. It comes in sturdy constructions offering the user with efficiency they need for many years to come.